So it’s fortunate that the famous traveller in time and space known only as the Doctor is in the area, and doubly lucky that, with the help of his pretty young assistant, Sally-Anne, he manages to defeat the deadly creatures and save the day. 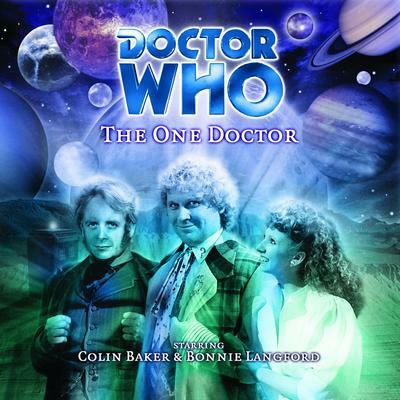 Colin Baker is the Doctor in…The One Doctor. For a show packed with humorous moments, Doctor Who rarely does out-and-out comedy. But those funny moments are highlights and stand-outs. Doctor Who prefers to play it a bit serious, even when it’s trying to be funny. There’s always the threat of absolute terror or imminent danger, and comedy only breaks the tension before the Daleks come rolling in. The few times Who has leaned more towards the comedic side, it’s turned into an absolute mess. Love and Monsters, anyone? So, when Big Finish decided to do a light-hearted audio release for Christmas 2001, when the world was reeling from 9/11 and the war in Afghanistan, they went all out. They took the hammiest of Doctors, a companion who’s cheerfulness drove viewers insane, paired them with a perfect pair of foils, and set them in an adventure filled with mistaken identity, dueling insults, do-it-yourself furniture, a never ending game show, and a port-a-loo. The end result is easily the funniest serial Doctor Who has put together in any format and what should be considered one of Big Finish’s crowning achievements. The Doctor accidentally sets the wide-range distress transceiver to maximum range, and it’s during a cutthroat game of Monopoly with one Melanie Bush that the TARDIS takes the pair to the vulgar end of time; a time where everything has been discovered, everyone knows everything, and all the wars are boring. The pair arrive on Generios One in the midst of a grand celebration. The entire population is praising their savior, who, with the aid of his lovely companion, has driven off the evil Skelloids. Of course, no reward is necessary…save, for, ten million credits so the Doctor and his companion, Sally-Anne, can purchase “pluvon power crystals” to power their time machine, the STARDIS. But this isn’t a future incarnation of the Doctor; the Doctor is sure of that. As the Doctor and Mel confront the “Doctor” and Sally-Anne, the skies over Generios One darken. A cylinder hangs in the atmosphere, demanding the three greatest treasures in the Generios System as tribute, or else it will destroy every planet in the system. The planet only has a short time to hand over the tribute; five marlegs (which is three Generiosian hours). And with the tribute spread out across the system, the only person who can gather them in time is the Doctor. But which one? From the very beginning, where Colin Baker gloats evilly over the progress of a game of Monopoly, The One Doctor is pure pantomime. For those of us who don’t hail from Britain, pantomime is, to pull from Wikipedia, “a theatrical entertainment, mainly for children, that involves music, topical jokes, and slapstick comedy and is based on a fairy tale or nursery story, usually produced around Christmas.” As opposed to the “serious, but witty” standard Doctor Who usually sets, The One Doctor is a full-frontal assault on the listener in the most delightful way, as we are greeted by “The Doctor” and his companion, Sally-Anne, as they stand fresh from a victory against the Skelloids. “The Doctor” in this case is played by Christopher Biggins, a well-known British comedic and theatre actor. Biggins plays the role like Colin Baker turned up to ’12,’ as he has to be since Baker is turned up to ‘11’ all by himself! Biggins is confident, he’s brash, he’s bombastic, and he’s a con artist named Banto Zane, who’s playing upon the legend of the Doctor to scam planets by inventing a fake threat and then showing up as their “savior” when all is lost. When the situation favors him, he’s modest, yet engaging and charismatic. When it all goes wrong, he’s a coward who cowers and waits for the end. Biggins plays the part with pure zeal, proud of his “achievements” and all he’s drawn from the Doctor’s legacy – including the STARDIS. Sure, it’s a port-a-loo and not a phone box, but it’s blue, rectangular, has writing on it, and always has coppers hanging around it! And Colin Baker…every time I hear him portray the Doctor, I want to find Michael Garde, tie him to a chair, and make him watch Fear Her until his eyes have both bled out and dried out. Baker has always been a louder and more arrogant Doctor. Now, imagine a script where he’s simply allowed to cut loose, and you have a grand performance. He’s stunned and flustered by “The Doctor” and how many things he’s simply gotten wrong about him, let alone the fact that he stole his very name! 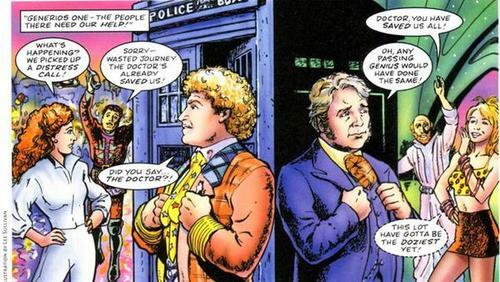 Sure, the Sixth Doctor is a bit portly and wishes for more manageable hair, but he’s still the Doctor and several very choice insults will establish that fact, thank you very much! So what do you get when you put the Doctor with a knock-off companion? As opposed to the cowardly “Doctor,” Clare Buckfield’s Sally-Anne is blonde, acidic, and has had…er…mammary enhancement, as the cosmos’ most complete information database would be happy to tell you. She is infatuated with “The Doctor,” until she meets the real thing. And then, she can’t keep her hands off of him, falling into mad infatuation as soon as she feels his two heartbeats. Buckfield is the money-chaser, the gold-digger, but deep down inside, she tries to do the right thing. While we might dislike “The Doctor,” Sally-Anne slowly wins us over as Buckfield plays up her pluck even as she snarks at and about Mel. The script and the sound go hand in hand. The script gives the Doctor and companion and “The Doctor” and companion a standard “fetch quest” ala The Chase, but it’s pretty much the framing device for the situations and the witty dialogue. I don’t want to go into detail without giving anything away, but anyone who’s had a long night of putting up shelves or found themselves on a cutthroat game show will definitely relate to the first two treasures, while the third treasure, its guardian and the situation could have come straight from a British sketch show. The script pokes fun at the situations and alien/monsters/villains throughout the history of Doctor Who. Seriously, it’s an audio play where the TARDIS still ends up in a BBC Quarry! And the Disassemblers are low-budget Daleks, with cries of “DIS-A-SEMBLE” and “WE ARE THE BEST!” The sounds of the cheering crowd, the voice of the Cylinder as it threatens Generios (a generic planet, mayhaps? ), the constant background noise of a game show hostess asking questions during the third episode…mix that in with a pantomime musical score, complete with triumphant horns, horns of losing, horns of distress, horns of pursuit…it all just comes together perfectly, a light-hearted farce that, after the seriousness of Colditz and Primeval, brings forth a smile well worth having. Next up – A year after a mysterious meteorite lit up the skies of New York state, Martian invaders laid waste to the nation. At least, according to soon-to-be infamous Orson Welles they did. But what if some of the panicked listeners to the legendary War of the Worlds broadcast weren’t just imagining things? Paul McGann is the Doctor in…Invaders from Mars. 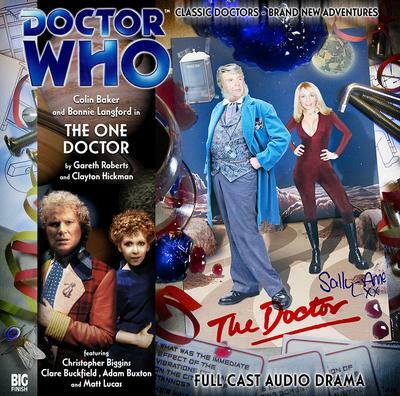 This entry was posted in Big Finish Review and tagged Big Finish, Colin Baker, Doctor Who, Mel, Sixth Doctor, TARDIS. Bookmark the permalink.